Tim Wallach, Lorenzo Bundy bolt Dodgers for Marlins. Two members of Don Mattingly‘s coaching staff in Los Angeles will join him in Miami. Tim Wallach was named the Marlins’ bench coach, and Lorenzo Bundy was named the Marlins’ outfield coach on Friday. Bundy was the Dodgers’ third base coach from the beginning of the 2013 season until August of this year, when Ron Roenicke took over and Bundy was shifted to outfield coordinator duties. After the season Bundy, 56, managed Navojoa of the Mexican League until he was fired in November. He was the Marlins’ bench coach in 1998, a team that was notable for briefly employing Mike Piazza and becoming the first defending World Series champion to finish last in its division. Wallach, 58, was the Dodgers’ third base coach from 2011-13 and Mattingly’s bench coach the last two seasons. He interviewed for the manager’s job that ultimately went to Dave Roberts. Mattingly had mentioned at his introductory press conference in Miami last month that he expected Wallach to join him. He did not mention Barry Bonds, who will steal the headlines nationally for being named the Marlins’ hitting coach. 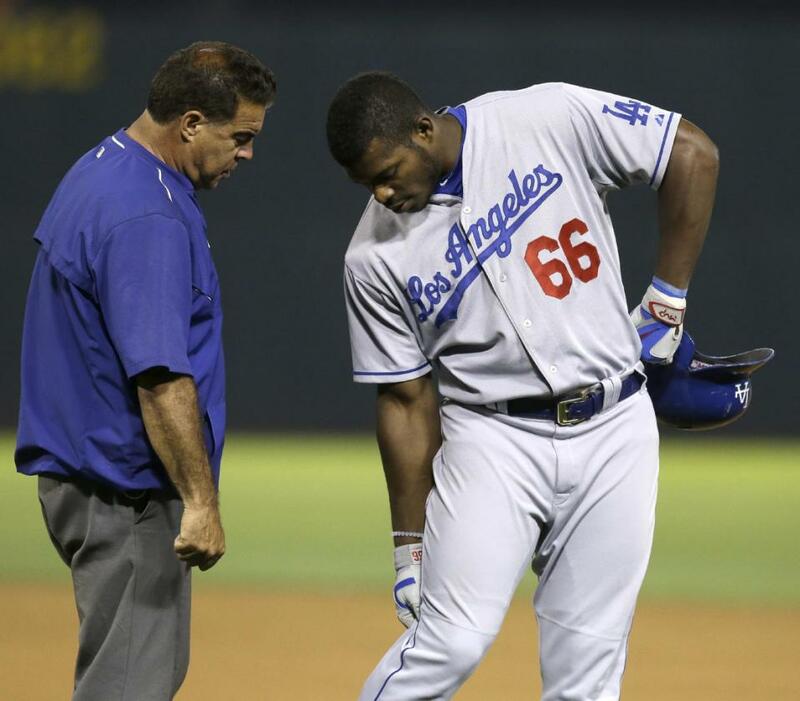 Game 119: The bullpen and Yasiel Puig’s hamstring go haywire — again. OAKLAND — The Dodgers’ bullpen imploded again, and Yasiel Puig was injured, in a 5-4 loss to the Oakland A’s on Tuesday. The box score is here. Telling Lorenzo Bundy he was no longer the Dodgers’ third base coach wasn’t easy for Don Mattingly. Ron Roenicke’s first game as Dodgers third base coach is tonight in Oakland. OAKLAND — Ron Roenicke will be the Dodgers’ third base coach tonight at O.Co Coliseum, and for the rest of the 2015 season. The move was announced Monday and dissected Tuesday afternoon. I also spoke to outgoing third base coach Lorenzo Bundy and general manager Farhan Zaidi prior to the game. More from them in a bit. Dodgers hire Ron Roenicke as third base coach, keep Lorenzo Bundy on staff. That gives the Dodgers seven uniformed coaches on the bench in addition to manager Don Mattingly, one above the major league maximum. To accommodate Roenicke, assistant hitting coach John Valentin will not be on the bench during games. Roenicke managed the Brewers to a 342-331 record from 2011-15, before being replaced in May. The West Covina native was an outfielder in the Majors from 1981-88, including parts of three seasons with the Dodgers (1981-83). Before being named the Brewers’ skipper prior to the 2011 campaign, the 58-year-old was a longtime coach for the Angels, serving as their third base (2000-05) and bench coach (2006-10). Dodgers’ third base coach details the perils of elevation on a player’s evolution. Today could be the day the Dodgers formally switch Triple-A affiliates from Albuquerque to Oklahoma City. The Oklahoman reported the move in August. Yesterday, BaseballAmerica.com reported that 23 minor-league teams have a two-week window to secure new affiliations beginning today, and that Albuquerque and Oklahoma City are two of those teams. When the move was first reported, I mentioned that former Albuquerque Isotopes manager Lorenzo Bundy (now the Dodgers’ third base coach) offered his scouting report on exactly what playing at 5,200 feet does to a developing baseball player.